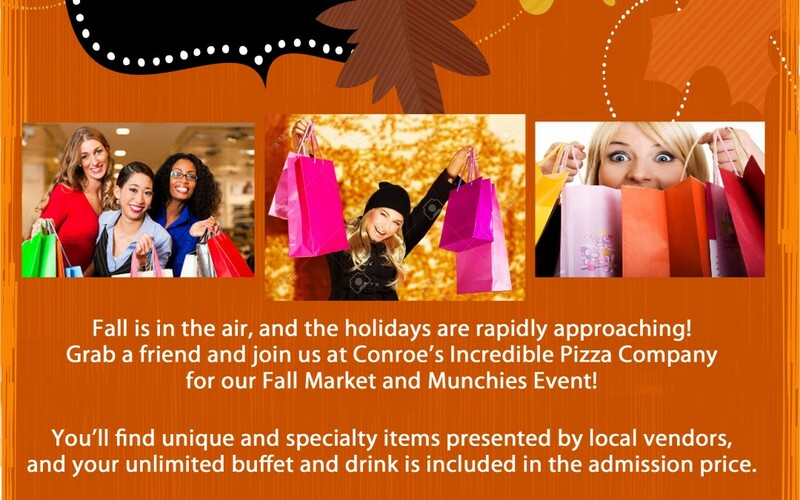 Fall Market & Munchies - Incredible Pizza Company - Enjoy our huge all-you-can-eat buffet, indoor Go-Kart Races, Bumper Cars, Route 66 Mini Golf, a huge video game arcade with prizes, Bowling, and more! Looking for something extra special for those on your gift list this holiday season? Look no further than the annual Fall Market & Munchies event at IPC on Thurs., Nov. 8. From 11 a.m.-7 p.m., the unlimited buffet and drink are just $5, plus you’ll get access to all of our local vendors displaying unique wares and gift items. You’ll be checking items off of your list in no time at all!